For those of you who may or may not know, I attend an array of schools around South-East Queensland. This actually all started around 4 years ago, when a few students (who were fans of Millennium Exile), approached their teachers and told them about me. Soon after, I received an email from a department head from a prestigious Gold Coast High School with a strong emphasis on Japanese culture. I was invited to attend the school as part of their “Japanese Culture Day”, in which I would be one of several guests teaching the children about different facets of the Japanese culture. In these presentations, I talked about the history of Anime, the difference between Manga and Anime and production costs. Furthermore, I would discuss how Japanese Anime differed from “Cartoons” around the world, and the effect that Anime would later have in the West. I was also asked to talk about Millennium Exile…..after all, this started because kids were fans of my work so they wanted to know about the project. I would educate the kids about how MillEx started, design and story-telling tips and most importantly - how to balance their passions with hard work. The students would usually reply either “Sumo” or “Kendo”. I know if I were just running about in a Sumo suit, or playing with wooden swords, I wouldn’t want to settle back down and listen to some white guy talk about cartoons…yet the children LOVED it! I would often be greeted by several kids from each class, either requesting my signature, or asking questions they had during the demonstration. It was an amazing experience to say the least and I was extremely moved by their enthusiasm. That being said, I was also extremely concerned. Here I was, the only Australian among Japanese people who were either currently visiting, or now living in Australia - all who were attending the school to teach a different aspect of their culture to the kids. The school had a very successful exchange program with several teachers, department heads and even principals from the Japanese High Schools attending these visits, and would regularly sit in on my classes. Thankfully, I was approached by these lovely men and women and thanked graciously for my demonstration. They were moved that their Anime had such a deep effect to people here in the West. Word eventually got out and soon enough, I began getting invitations from schools all over. From public to private schools, primary to High schools…little old Ty was up there, teaching kids about Anime and Millennium Exile. 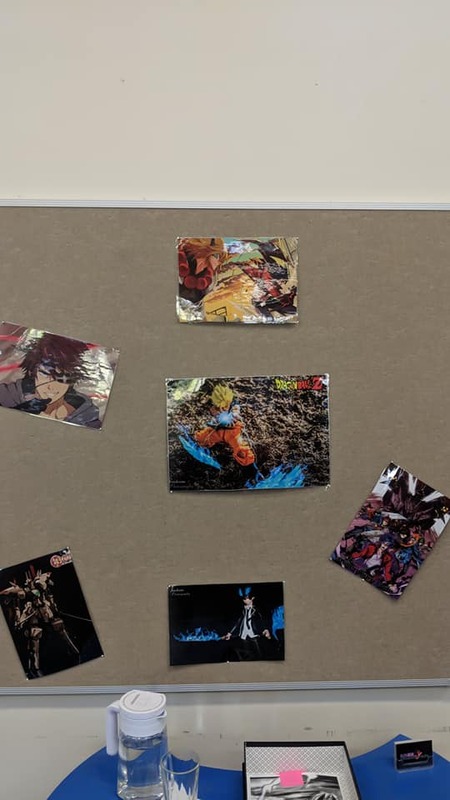 I would even arrive at some schools to find my picture up, along with my work printed out on the walls….there was even a drawing of me on one of their whiteboards! I’m now lucky enough to do this regularly, not enough to be a full-time job of course….but I’m just so grateful for the opportunity to share my passion with these young minds who are all just brimming with excitement and potential. Not much to report on this week, as I have been spending quite a lot of time, preparing fro more school visits and my upcoming convention panel. Hary is still progressing through, and adding finer details to the special Millennium Exile Patreon piece, so be sure to stay tuned. If you wish to become a Patron, you will not only be helping the project move forward - but you will also be supporting the talented artists from around the world who also work on the project. Together we can help make Anime history!